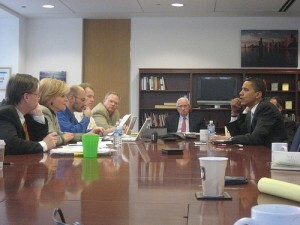 Sun Times Endorses Obama for President – Ya Want a Mulligan Yet? Americans are ready to be one country. By the millions, they yearn to bridge their differences, to find common cause, to rise above ideology, race, class and religion. Our endorsement for president of the United States goes to Sen. Barack Obama, Chicago's adopted son. He has the unique background, superior intellect, sound judgment and first-rate temperament to lead our nation in difficult times. Our next president must be a person of steady temperament, superb judgment and compassion. He must stand tall for America, first and always, but be unafraid to listen to the world. He must demand the best in us. In Barack Obama, we see America's best hope for a president who is right for the times. That’s not all the accolades endorsement offered, just some of those supporting their support of Obama – “Chicago’s adopted son”. All of these assumptions about Senator Obama seem to have been based on the singular accomplishment during his interview with the Editorial Board: “When he finally sat down with the Sun-Times Editorial Board and answered every question, the Rezko story lost its steam.” Here’s a pdf of the entire interview. In order to appreciate the astonishing lack of depth of this “interview”, you must read the entire transcript. To call it a superficial inquiry is a vast understatement. It was a perfunctory love fest. It’s clear that the entire exercise was staged to validate an endorsement decision that had already been made. So, after three years, do you folks sitting around the table above want a Mulligan on your endorsement? Or, have your expectations been fulfilled? What say you? It’s no secret that Chicago’s two major daily newspapers are circling the drain. Fewer Chicagoans are getting their fingers stained turning the pages of newspapers. Daily circulation for both the Tribune and Sun-Times for the six-month period ending Sept. 30, [declined] according to numbers from the Audit Bureau of Circulations. The Tribune's daily circulation fell by 2.7 percent to 425,370, while the Sun-Times' weekday numbers of 236,371 reflected a 7.2 percent drop. There was some good news for the Tribune. Their Sunday circulation numbers rose to 781,128. The Sun-Times' Sunday numbers fell slightly to 233,445. Compare those numbers with these tallied by the Audit Bureau of Circulations (ABC), according to the Tribune, in the not too distant past. In the seven years from 2005-2011, the Monday-Friday circulation of the Trib went from 586,122 to 425,370. For the Sun Times, the numbers declined from 349,968 to 236,371. In the old math, that’s a 27% decline in daily circulation for the Trib in the last 7 years, and a 32% decline for the Sun Times. In short, Chicago’s two major dailies are in a drag race to the cliff. Causes for their decline abound. People are increasingly looking to the internet for news. TV cable channels have multiplied with outlets offering up-to-the-minute, 24-hour news. Younger generations have grown up with cell phone where they can now read the news while commuting on the train, keeping their fingers clean of ink. There’s another reason the two big old dailies are dying. During the run-up to the 2008 Presidential election, both Chicago dailies served as shills for the Obama Campaign. The vetting of candidate Obama was powder-puff league quality, rather than hardball major league reporting. Puffery prevailed. Sure, Chicago’s long been a Democrat Party town, and many Trib and Sun Times readers support the bias. But others, particularly those in the burbs, live where Democrat water doesn’t run as deep as in the City. For the Fourth Estate, there’s a price to be paid for playing fast-and-loose with the news. Even those in sympathy with a bias, whatever it may be, eventually lose their underlying confidence in a news source the spins the story line, drives a meme, and promotes a political theme. Let’s say it aloud: The two Chicago dailies helped Senator Barack Obama become President Obama. The Tribune cooked the news somewhat more so than the Sun Times, but both outlets promoted his election. And as his presidency fails, some of the blame is falling at the feet of the Chicago print media that helped put him in the White House. Today, if readers want to more fully understand Chicago and national politics they must expand the horizons of their news sources to include Chicago’s New Media. If the people of Northern Illinois want to stay abreast of stories like the Rezko and Blago trials, they need to visit outlets like the Chicago Daily Observer and Citizen WElls. Both websites are linked in the margin of this website, along with Steve Bartin’s Newsalert, a running, updated compendium of current articles covering a variety of topics of interest, specializing in political corruption. A national pastime these days. These are the news sources of the future – Chicago’s New Media. For the Old Media is dying a slow, self-inflicted death. And the New is just now being born. Meanwhile, there will always be homes that welcome the old ink and paper media. Tribune reporter Annie Sweeney wrote a nearly insightful piece on a former Governor Blagojevich “advisor” identified in the body of her piece as Antoin Rezko, and in the title as Tony Rezko. Who is Annie writing about? Is this the same Tony Rezko who served with Allison Davis and Valerie Jarrett as Barack Obama’s senate election campaign finance committee? She doesn’t mention that. Is this the same Tony Rezko who Obama said he only occasionally shared lunch with, but who federal mole Bernard Barton, AKA John Thomas, reported to have witnessed frequently meeting at Rezko’s office where Barton-Thomas worked while wired. She doesn’t mention Obama. Is this the same Tony Rezko who helped Obama and Michelle buy that Hyde Park mansion near his home in Chicago, helped him expand his yard, helped him…well, you know all that. She skips all that, too. Or, was this the former governor’s “advisor” – it’s such a dignified word, “advisor” – who gave former Governor Blagojevich prescient recommendations on competent and knowledgeable persons he, Blago, should appoint to key state committees in order to best serve the tax-payers of Illinois? Is this Tony Rezko the “advisor” who whispered in Blago’s ear giving timely and clever political advice – cause that’s what “advisors” do, you know – to Illinois’ Chief Executive Officer so that he might act, in all ways and in all things, on behalf of the greater interests of the people of the Land of Lincoln? …and not Blago’s senior extortionist bag man and close friend of the President. It’s just hard to tell from Ms. Sweeney’s article who she’s writing about. Does Ms. Sweeney really believe that this Tony Rezko was ever going to be called as a witness at “other key Blago trials” where, on cross examination, he might have been forced to elaborate on his relationship with Barack Obama and commit perjury when he lied? Did Annie just move to Chicago from Bulgaria? For whom does Ms. Sweeney work? Oh, that’s right – the Chicago Tribune. A newspaper that’s been covering-up for Chicago’s favorite son for a long time now. Sure. We get that, too. Blago is next to be sentenced, on December 6. Conventional wisdom among the Crook County media pundits is that, since Tony Rezko drew 10½ years, Dead Meat is facing the realistic prospect of even more time. But for Dead Meat, there’s no commutation, no pardon, no escape on the horizon coming from the White House. Blago and Barack didn’t have that special, symbiotic relationship built, literally, on bags of cash that once linked Tony and Barack at the wallet. He can’t relate details about the former Chicago corruption days of the POTUS, and, thereby, shave off jail time. The U.S. Attorney’s Office has done a stalwart job of protecting Chicago’s favorite son through the whole sordid affair that’s whirled around Tony and Rod. 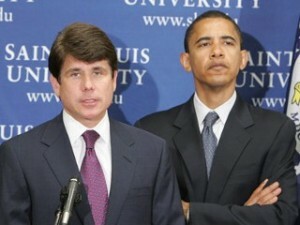 Blago starts talking about Chicago Obama and he might get life without parole! He can’t squeal on Attorney General Eric Holder’s association, once upon another time, with the effort to endorse a mobbed-up casino in Rosemont. Holder is Patrick Fitzgerald’s boss. How would that work? – Blago fessing up that Holder’s law firm was to get $300 g’s for certifying that the people behind the casino were all former Eagle Scouts and fine, church-goin folks, when he knew otherwise. No joy there for Blago. So does he tell on the current Governor’s Chief of Staff for what he might have done as Tony’s Chief Financial Officer? Naw, that’d be small potatoes. Besides, who cares? He has some dirt on the current Gov himself? Yawn. Or, maybe he details how Rezko’s close business associates Dan Frawley and Dan Mahru participated in…oh, serial bad behaviors of interest? Nope. You don’t use a big fish to catch smaller ones. Okay, suppose Blago does a core dump on Illinois corruption, names names, give dates, outlines plots and pinpoints where the bones are buried, metaphorically speaking, of course. Maybe he exposes details of the nefarious world of a longtime, high-profile, corrupt, senior alderman. Or, tell true tales about the Daley’s. 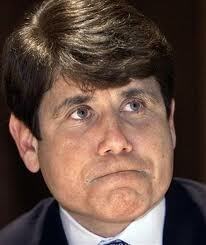 Rahmbo might like that, but it wouldn’t help Blago. 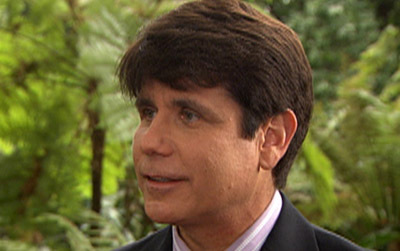 So just what information, what “cooperation”, does Blago have to offer now that he knows how deep the water may be when he walks off the plank on December 6th? Is there even anything he can tell that will make the outcome any less catastrophic for him? Or, would his prosecutors just as soon he say nothing and vanish quietly into the federal penal system? Sort of like Norman Hsu did – remember him? You probably don’t, and that may be just what the U.S. Attorney’s office is hoping for. That Dead Meat disappears down the federal rabbit hole and in, say, 15 years, no one notices when he walks out with short gray hair, his children grown, Patty remarried, a self-defeated man. Not a pretty picture. Not looking good for Dead Meat. WOW! Today Federal U.S. District Judge Amy St. Eve sentenced Tony Rezko to 10½ years in prison! That can’t be good news for Blago. He’s next. Does this mean that Tony will do at least the federally mandated 85% of his time before being a free man again? Maybe. Maybe not. Presidential Candidate Senator Barack Obama was considerably less than forthcoming and truthful when describing his relationship with Tony before the ’08 election. In short, he lied. Illinois Pay-to-Play will elaborate on that assertion in the weeks ahead. We expected that, today, Tony might be a free man, sentenced to time served. Or, that his sentencing might be postponed yet again. We were wrong. But that won’t stop us from sticking out collective neck again. Rezko expects to be pardoned by his friend Obama. Whether Obama wins or losses (or doesn’t even run in) the next election, he will pardon his friend and financial benefactor Tony after the ’12 election. Tony is expecting that, given two eyewitness accounts known to us wherein Tony said he expects Obama to pardon him. We hope we’re wrong about that prediction, too. Very wrong. Tony did the crime – he should do all the time. And more. It’s time that will tell. As the nation wakes up to the systemic corruption of the Obama administration, and James O’Keefe outs journalistic fraud at the New York Times, it’s only a matter of time until the Chicago mainstream media comes under scrutiny for ignoring the background of the once junior Senator from Illinois during their coverage of the ’08 election. Not because Chicago’s media luminaries didn’t know his associations with persons of questionable political ethics. Not because they didn’t know of his lack of experience at running anything as large as a White Castle franchise. And, not because they didn’t know of his friendships with, let’s say, person with less than conventional beliefs about the nation he was campaigning to lead. Not for any of those reasons will the Chicago media come under popular indictment for journalistic malpractice. The Solyndra scandal cost at least a half-billion public dollars. It is plaguing President Barack Obama. And it's being billed as a Washington story. But back in Obama's political hometown, those of us familiar with the Chicago Way can see something else in Solyndra — something that the Washington crowd calls "optics." In fact, it's not just a Washington saga — it has all the elements of a Chicago City Hall story, except with more zeros. Wow! What a journalistic revelation! You mean the politician from Chicago, now in the White House, is metastasizing Pay-to-Play across the nation and the folks back in Chicago knew it was coming? And they didn’t warn the rest of us? That takes your breath away, don’t it? Coming as it does from Chicago’s most prominent living reporter. Well, welcome to the party, Kass! You didn’t know that Pay-to-Play would metastasize throughout the nation with a President Obama? Or you did know and didn’t say? While you're writing about solar corruption these days, here are some other tumors you might check out. Start with the Daily Caller – yea, I know, it’s one of those amateur media outlets you pros look down on – and learn about First Solar, SolarReserve ($737 federal loan), SunPower Corporation and Abengoa SA. They’re part of the solar power scam. And Barry has buds there, too. What a surprise! More Pay-to-Play. As for what set you off – i.e., Solyndra – no worries there, John. As you wrote, “The FBI is investigating what happened with Solyndra.” Right, and Eric Holder is their boss. We all remember how Eric had such a stellar legal reputation that Dead Meat planned to pay his law firm $300,000 to certify that the mob mutts who were going to build a casino in Rosemont were really all upstanding troop leaders for the Boy Scouts. 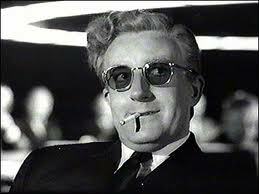 You Chicago media boys and girls, keep bangin’ on your pianos, while Rome burns. With a range of verbal dexterity seldom witnessed among contemporary politicians, J.J., Jr. chopped his way through all the fuss and fury surrounding the Obama administration’s failing efforts to get Congress to pass his Jobs Bill. With the decisive thrust of the agile Karate Master, he defined a solution for the President. In his interview with Nicholas Ballasy – an apropos last name for a man willing to stand toe-to-toe with J.J., Jr., while representing a non-liberal news outlet – Ballasy listened stone-faced as the Congressman advised the President. “President Obama tends to idealize [suppose he meant idolize?] — and rightfully so —Abraham Lincoln, who looked at states in rebellion and he made a judgment that the government of the United States, while the states are in rebellion, still had an obligation to function,” Jackson told The DC at his Capitol Hill office on Wednesday. “On several occasions now, we’ve seen … the Congress is in rebellion, determined, as Abraham Lincoln said, to wreck or ruin at all costs. I believe … in the direct hiring of 15 million unemployed Americans at $40,000 a head, some more than $40,000, some less than $40,000 — that’s a $600 billion stimulus. It could be a five-year program. For another $104 billion, we bailout all of the states … for another $100 billion, we bailout all of the cities,” he said. “We’ve got to go further. I support what [Obama] does. Clearly, Republicans are not going to be for it but if the administration can handle administratively what can be done, we should pursue it. And if there are extra-constitutional opportunities that allow the president administratively to put the people to work, he should pursue every single one of them,” Jackson suggested. Although J.J., Jr. didn’t have time to define the work these 15 million unemployed Americans would be doing to earn their incomes from the Federal Government, doubtless some would be engaged in: voter registration campaigns among heavily disenfranchised communities – like his, of course; changing light bulbs in every American’s home in order to dispense with the incandescent bulb and substitute a G.E. florescent unit Make in China; picketing outside the homes of Tea Party members and persons identified as rich Republicans; and, as the ’12 general election approaches, serving as audience extras for enthusiastic Obama Rallies For Victory. Only a political sensei like J.J., Junior would think to equate Congressional Republicans with the Confederate States of America of the Civil War era, and compare Republican (and some Democrat) opposition to Obama as a Rebellion. The linkage is, well…pure brilliance. Let’s see if the editorial page of the Sun Times, or the Tribune, endorses J.J., Jr.’s solutions. 50-50 odds.